Several weeks ago, in my Badlands post, I briefly mentioned the Wounded Knee massacre site on the Pine Ridge Indian Reservation. I thought my recommendation this time around should go back to that. I applaud anyone who wants to read more on Native American history. Over the decades since I was a kid, we’ve collectively become more sensitive to their plight. They are no longer depicted as the “savage enemy” in popular culture, but IMO we still don’t understand the full depth & breadth of the trauma these people went through. 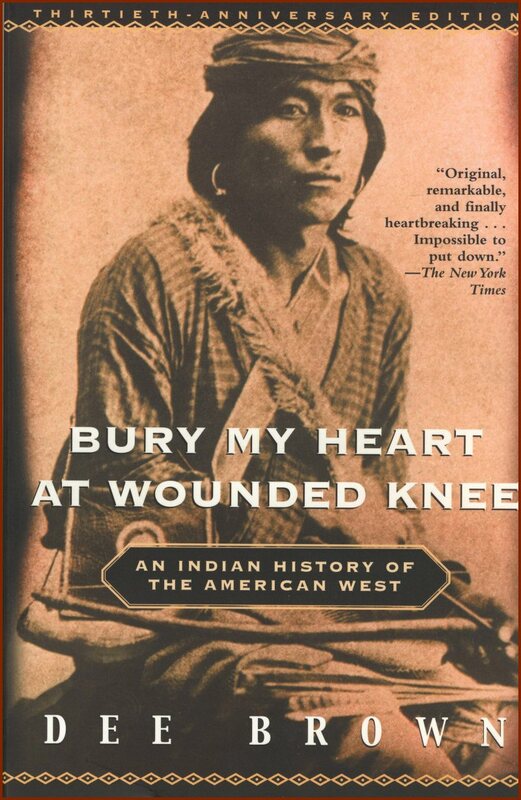 For those wishing to embark on an independent study of the Native American, I can recommend no better starting point than Dee Brown’s classic “Bury My Heart at Wounded Knee”, the first widely read work of its kind: a history of Indians by an Indian. I have to be totally honest here: Brown isn’t the best writer in the world. His prose isn’t graceful or eloquent, but it is written from the heart, and in a storytelling style that suits the voice of the Native American people. Unlike Europeans, tribal ancestors spoke (or even sang) their histories, passing tales & lessons down in a great, verbal tradition. Brown relates these sad tales of Indian oppression in a similar, conversational style that honors this tradition. Reading “Bury My Heart” is like listening to tales of old, spoken by wise, yet dispirited, elders to wide-eyed youth. Pick it up & give it a read. Many of guys write about this subject but you wrote down really true words!! on July 22, 2010 at 6:56 pm Lady Martina-claire, many paws. I read this book in England and was educated in the plight of the Red man. I cried for days, I felt the pain. I moved to the USA and fell in love with Cherokee and its people. I am Many paws now, I have studied Cherokee history and was appauled….what we did to them….I have learnt Tsa la gi and love the old ways and beliefs. It has effected me profoundly, I no longer consider myself white in my affiliations, I die a little every time I think of what they went through. Read this book and start learning what they do not teach in schools. Walk the red road, head held high in Wakan tanka’s name forever. Dear sir or madam! I am verry interested at Indians. But I am facing a great lack of lioterature. Where can I find this book? I come from Slovenia. I know you can purchase it on Amazon.com here in the States at least.